SCRANTON, PA – JANUARY 22, 2014 - Kane Is Able, Inc. has been named to the Top Green Providers list by Food Logistics magazine. The list includes companies who are exceeding industry standards in their sector and whose products and services are driving sustainability from farm to fork. “Our Top Green Providers demonstrate leadership in sustainable supply chains, which in turn positively affects their customers as well,” notes Lara L. Sowinski, editor-in-chief for Food Logistics. KANE combines freight shipments of small to mid-sized shippers through its retail freight consolidation program. This dramatically reduces transportation costs, streamlines load handling requirements, and reduces the number of trucks on the road, creating an economical and green logistics solution. 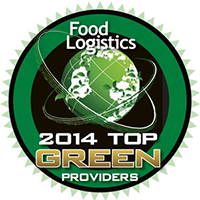 Companies on Food Logistics’ Top Green Providers list are profiled online at foodlogistics.com.